The D_Shape Mega Scale 3DPrinter uses a special structure and print head to "print out" three-dimensional structures up to 6x6 meters in size. Just right for that house or replica temple you've been thinking about. The device was designed by Enrico Dini. This new machinery enables full-size sandstone buildings to be made without human intervention using a stereolithography 3-D printing process that requires only sand and our special inorganic binder to operate. Stereolithography, also known as 3-D layering or 3D printing, allows the creation of three-dimensional (3-D) objects from CAD drawings. It is already used to manufacture small objects. To achieve a building on a full scale will only require a machine of adequate size and the right binder. 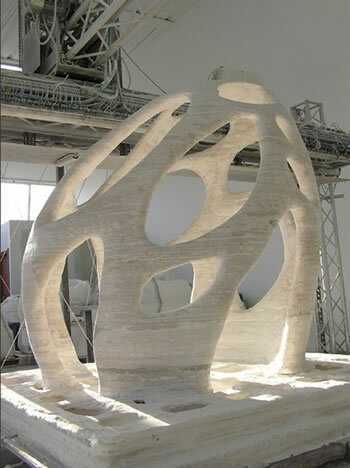 The Monolite building process is similar to the “printing” process because the system operates by straining a binder on a sand layer. This is similar to what an ink jet printer does on a sheet of paper. This principle allows the architect to design fantastically complex architectural structures. Seen from the exterior, Monolite appears like a big aluminium structure inside which the building will be constructed. CAD-CAM software drives the machinery during the building process and this structure holds the printer head, which is the real core of the new technology. Technovelgy readers will note the similarity with the Contour Crafting 3D House Printer, but I say, the more the merrier. This kind of technology reminds me of the architectural coral from Larry Niven's 1968 novel A Gift From Earth. It's not an exact match, but it shows what you can do with the right building composite. Read more at the D_Shape website and this D_Shape Mega Scale 3DPrinter [pdf]. Via Next Nature.